Move your oven rack to the center position and preheat your oven to 350°F. Whisk dark brown and granulated sugars and 1 teaspoon of vanilla into the melted butter, you should have a nice thick paste. If it looks too soupy/buttery, add a few more tablespoons of dark brown sugar. On a generously floured surface, roll out dough into a large square about ¼ of an inch thick. Use a pastry brush to completely coat the surface of the dough with your butter mixture. Lay out the strips of bacon horizontally at even intervals, each bun will have a strip of bacon in the center (you may want to halve your strips of bacon lengthwise and lay them next to each other and slightly staggered for each bun so you get bacon throughout the whole bun. Use a serrated knife to cut five buns (making sure that the bacon is placed in the center of the dough). Tightly coil the buns and place them in a greased 8 x 8 baking dish. Brush the buns with milk then bake until the tops are golden brown and crispy, approximately 45 minutes (keep a close eye on them, mine took I think closer to an hour but there were other people going in and out of the oven). While the buns are baking brown the butter for the icing in a saucepan over medium heat, swirling the pan every so often. In a medium bowl whisk together butter with confectioner’s sugar and vanilla. Adding a little more sugar if your frosting looks too buttery. 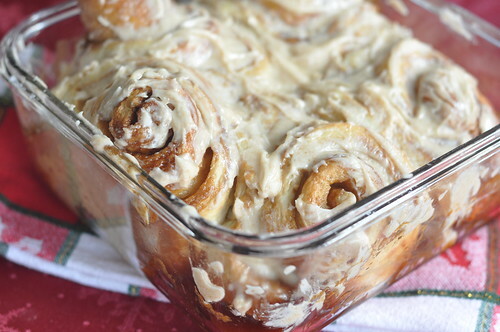 Cool the cinnamon buns for a couple of minutes then frost and serve warm.